Why POP3 Email Instead of IMAP? You make lots of good points about a new approach to laptops, or a return to the original philosophy, for Apple. I agree that a PowerBook with easily accessible hard drive and RAM, plus upgradable processor and video cards, is an idea whose time is here. A little more bulk to the machine would indeed be needed. Even this Pismo that I'm typing on isn't ideal for laptop use, as its thinness makes it prone to flex. I don't know though that I'd be interested in a big laptop that could serve as a legitimate desktop too. I haven't used one of the 17" 'Books, so I don't have a reference point for that option. I'm content with the smaller form factor. I've recently acquired a pair of 5300cs PowerBooks that are in excellent working and cosmetic condition. This is my first experience with this vintage PowerBook, and there are things I like about it. One is the bulk of the computer. Its thicker, heavier base seems to be really durable for transporting and using literally in the lap. Also there's actually enough lid area that a widescreen display could be fitted to the 5300 case or a similar one, making a really attractive little computer, provided it were fitted with at least a G4, a gig of RAM, and 32 MB or more of VRAM. Since where I live isn't subject to more than occasional power interruptions, a big portable substitute for a laptop isn't a need for me. 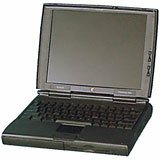 But a sturdier, more powerful, small PowerBook would be very attractive. Yes, the WallStreet was the high water mark in Apple laptop versatility, with its robust build, two expansion bays, two PC Card slots, and comprehensive array of I/O ports. The Pismo has proved a more successful upgrader only because it's more modern - "New World" ROM, 100 MHz frontside bus, better video card, supports 1 GB of RAM - not because its from factor is superior to the WallStreet's in the upgrade context. On the other hand, the WallStreet is a pretty heavy rig to lug around. The Pismo is no lightweight, but it is a lot nicer to handle. On the other hand, the 17" PowerBook was a pleasant surprise in terms of handling. The footprint is definitely large, but I find it surprisingly unbothersome. I love the PowerBook 5300's size and proportions. 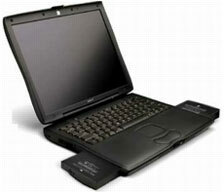 Ditto the PowerBook 1400. I still have examples of both in working condition. Actually, the footprint of the 12" iBook is pretty close to the 5300 and 1400, and I was a fan of it as well. Those two PowerBooks are amazingly heavy considering their trim footprint. The 1400 has proved rugged as well, but the 5300 not so much. I liked my 5300, but I would have to rate every other Mac laptop I've owned since as better machines. Actually, when I tried a different bay, the drive has been working better for me (no errors since then). Also (just in case) after I notified the seller via eBay about the difficulty, he/she said that another drive would be on the way once they get one in, and they'd notify me with a tracking number once it shipped to me. So one way or another, I will have at least one working drive. My problem may possibly have been that the internal connector in the other bay had a little dirt/corrosion/oxidation in it that caused the problems, so I'll get around to trying to clean the other bay shell before the other drive assembly arrives. If the first one stays good for me, I will probably/likely be sending a second payment, and I may be able to get the other PowerBook enough parts to make it work, and have a second Pismo with DVD/CD±RW and (eventually) 1 GB of RAM and 120 GB hard drive. I am not somewhat noticing my system seeming not as quick, so I may get a G4 for this Pismo next, or else go for a used AlBook G4 perhaps. Glad to hear that you're getting it all sorted out. As one who uses both Pismo and AlBook every day, I can affirm that they both have their virtues. I like the bigger display and the greater speed and power of the AlBook, but I prefer the feel - both tactile and intangible - of the (G4) Pismo, and the latter definitely has the edge in expandability and general versatility. Reliability-wise, it's a wash so far. "...even 1024 MB with two 512 MB modules, although there are some minor limitations that inhere with 1 GB of RAM installed." I cannot find a source of information anywhere that explains these limitations. I've recently upgraded to 1 GB in my G4 upgraded Pismo and have not noticed any problems whatsoever. Could you please tell me what these limitations are? Furthermore, it may be helpful to add this info to your article, thus making it a more Compleat Guide. As I understand it, the minor caveat pertaining to the use of more than 640 MB or so of RAM in the Pismo is that the PRAM battery may not have enough reserve to keep more RAM than that alive during battery changes with the PowerBook sleeping. I haven't experimented with this issue personally because I've never had more than 640 MB memory in my Pismos, however, I don't think it's a major issue, and many people report very satisfactory results with two 512 MB RAM modules installed. Well, nothing really. A 15" MacBook Pro with 4 GB of RAM is a nice setup. I've never used external displays on a routine basis with my laptops, which I suppose is partially why I'm partial to the 17" units. With the MacBook Pros and aluminum PowerBooks, the 17" models are a bit easier to work on, although neither of them is a pleasure in that context, something I hope will improve (at least in terms of hard drive access) in the next revisions. I've never been a fan of wireless input devices, but some new products from Logitech are changing the game. The new Logitech V-550 Nano wireless mouse almost instantly became my favorite mouse I've ever used, and the diNovo Edge keyboard is pretty seductive, although I still like my wired Kensington SlimType 'board better. I can appreciate how that aspect of IMAP would appeal to users who access their mail from different locations frequently. My preference for POP 3 is to a large degree due to the fact that I like to have my email archives on my hard drive without the necessity of an Internet connection to access them. Broadband is still not available where I live, so I'm stuck with a dialup connection, and in mobile mode one is not always (or, in this neck of the woods, very often) in range of a WiFi hotspot. Gmail and several other webmail services also support POP 3 with the option of leaving copies of downloaded messages on the server, which isn't quite the always-synchronized solution that IMAP offers, but it is a reasonably versatile compromise. Thanks for the link to that article. I hadn't seen it, but the experience described almost exactly mirrors my own. This pair of specs I bought from Goggles4U last fall are the best glasses I've owned in nearly 50 years, most importantly because the titanium frames and high-density lenses make them feather-light, but optically they are excellent as well. And they only cost me about $35 Canadian delivered to my door.